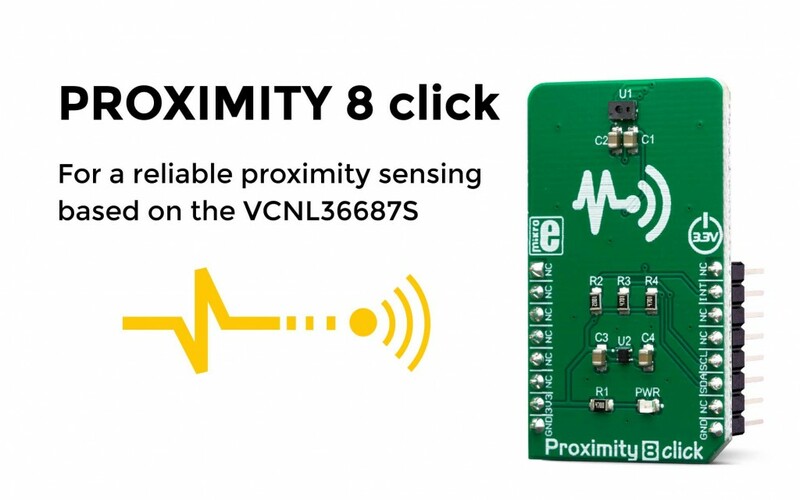 Proximity 8 click is a close proximity sensing Click board™. It features the VCNL36687S, a proximity sensor with VCSEL in a single package. It allows a reliable close proximity detection, using the advanced Vertical-Cavity Surface-Emitting Laser (VCSEL) which combined with a smart digital frontend circuit, allows very low power consumption and a high proximity sensing (PS) reliability. The Click board™ can be operated in several modes, including the Logic Output mode: close proximity of an object will trigger an interrupt. When the object moves away, the INT pin will be de-asserted. The difference between this mode and the other modes is that the user does not have to read the status bit to clear the interrupt and de-assert the INT pin. It will be controlled automatically by the low/high threshold values. To improve the reliability of the detection, the VCNL36687S employs a smart cancelation scheme. It uses the value stored within the register to subtract it from the output measurement, reducing the crosstalk phenomenon. A sunlight cancelation mode allows the device to be used even when exposed to sunlight. Low-power IoT close proximity sensing, etc. For more information about the Proximity 8 click, please visit our website.